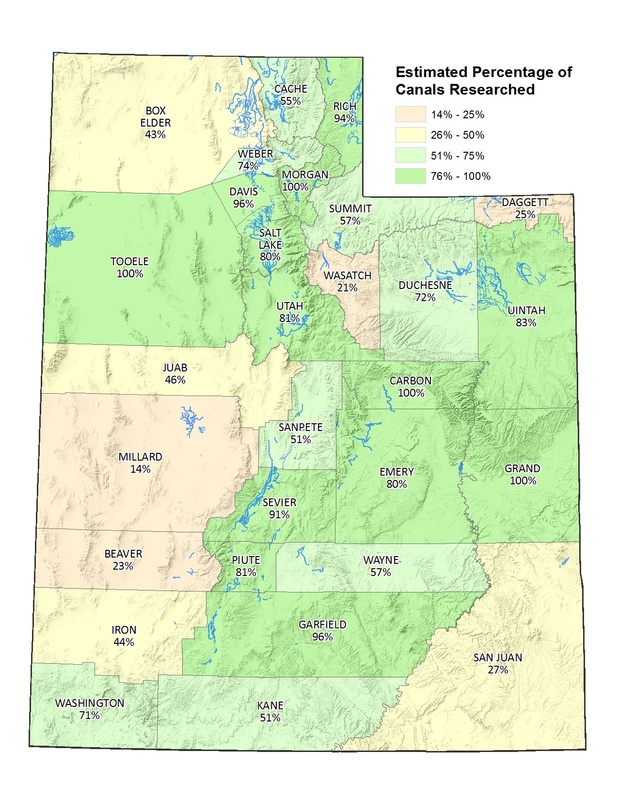 In 2014, the Division of Water Rights (DWRi) was tasked with creating an inventory of irrigation canals in the State of Utah. The legislation requiring the inventory required the following criteria: canals had to be open, human­ made, and carry more than 5 cubic feet per second (CFS) of water. All private and commercial canals that meet the criteria are included. With little data meeting the criteria available initially, we started with the DWRi databases of water and irrigation companies and the USGS National Hydrology Dataset (NHD). The legislation requires the inventory to be completed within three years. In that time we will have to research over 1,100 water companies and 9,800 miles of features in the NHD data attributed as ‘canals’. With one year left to complete the inventory we have digitized 3,948 miles of canal features based on data submitted directly by water companies and through aerial photo investigation. We are about two ­thirds complete with the inventory. We have discovered that most of the company contact information and much of the NHD data is outdated. Many NHD features are now piped or are no longer in use, and some companies have merged into larger entities, or simply no longer exist. and if the company adopted a safety management plan according to Utah code 73­10­33. Data meeting the legislative requirements is available on the Water Rights website via online map and by downloadable shapefile. The Water Rights canal inventory webpage is located at waterrights.utah.gov/canalinfo. This page includes the water company information and a link to a web viewable map of the canals. The shapefile data can be found at waterrights.utah.gov/gisinfo/wrcover.asp. A link to download the CANALS shapefile. Both the online map and the shapefile are updated nightly.